(SWEETWATER) – Winning is so nice, she did it twice. Now Kacee Merrifield wants it again, and so does one of her classmates. Merrifield is a nursing student enrolled in the associate degree program at Texas State Technical College in Sweetwater. She has competed at SkillsUSA two years in a row, winning state both times and placing nationally. “It’s a very validating feeling when you get to test your skills against others in your industry, but it’s so much more than just winning a medal,” Merrifield said. SkillsUSA is a partnership of students, teachers and industry working together to ensure America has a skilled workforce. In 2017 Merrifield placed first in state for Health Knowledge Bowl, continuing on to win fourth at nationals. In 2018 she won first in state for Nurse Assisting and sixth at nationals. She will compete in Practical Nursing this year. “I love that SkillsUSA offers a platform to meet other professionals. You meet so many people and make friends and get to travel. I really enjoyed what Skills has done for me,” Merrifield said. Hoping to win his second first-place title is fellow nursing student Corbin Calsoncin. Calsoncin and Merrifield both graduated from TSTC in Breckenridge with a certificate of completion in Vocational Nursing in 2018. Calsoncin is also currently enrolled in the nursing program at TSTC in Sweetwater. “I was nervous my first couple times I competed, but I feel better now and am more prepared,” Calsoncin said. Calsoncin placed second at state in Medical Math in 2017, but placed first in Math in 2018 and went on to place ninth at nationals. Calsoncin will compete in Medical Math again this year. Not only do Merrifield and Calsoncin compete in SkillsUSA at the collegiate level, but they also judge the high school level. Merrifield and Calsoncin will compete at the SkillsUSA 2019 Leadership and Skills Conference on April 12-14 at TSTC in Waco. Both students encourage anyone interested in nursing to visit TSTC and take advantage of the opportunities available with SkillsUSA. TSTC in Sweetwater nursing students Corbin Calsoncin, left, and Kacee Merrifield, right, prepare to compete at SkillsUSA in April. 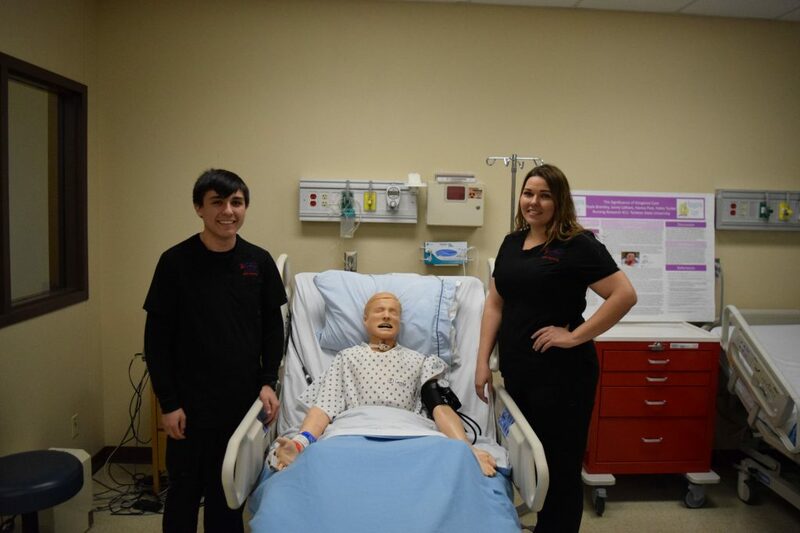 This entry was posted in Breckenridge, SkillsUsa, Sweetwater, Uncategorized, West Texas and tagged Breckenridge, medical, nursing, Skills, SkillsUSA, Sweetwater, Texas, TSTC on March 14, 2019 by Sarah Trocolli. (Sweetwater) – How would you define a hero? As a parent? As a soldier? Texas State Technical College student Roy Banda is all of that and more. Banda, 32, is a former Marine now pursuing an Associate of Applied Science degree in Diesel Equipment Technology at TSTC in Sweetwater while fostering five children at home in Brownwood. “I was working in a factory, with no way to move up anymore. So I talked to my wife, and now I’m using my GI Bill to create a career,” Banda said. Banda served four years in the Marine Corps as a rifleman between 2007 and 2011, with deployments to Iraq and Afghanistan. “My time in the Marines helped me a lot with discipline, obedience and work ethic in everyday actions and now school,” Banda said. One example of Banda’s self-discipline is his dedication to be early for class each day, despite an almost two-hour commute. Even though Banda attends school full time, he and his wife have a houseful of six kids, five of whom are foster children they plan to adopt. “We decided to foster just to help out, then fell in love with them,” Banda said. Banda will compete in Diesel Equipment Technology at the SkillsUSA 2019 Postsecondary Leadership and Skills Conference on April 12-14 at TSTC in Waco. Banda is expected to graduate in spring 2020 and plans to build a positive reputation so he can open a shop of his own. 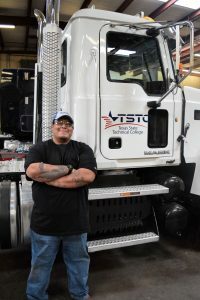 TSTC in Sweetwater Diesel Equipment Technology student, veteran and parent Roy Banda, will compete at SkillsUSA in April. This entry was posted in SkillsUsa, Sweetwater, West Texas and tagged Diesel, Diesel Tech, Marine, Parent, SkillsUSA, Sweetwater, TSTC, Veteran on March 1, 2019 by Sarah Trocolli.